A couple of years ago I found and made a recipe for Turkey Pumpkin Stroganoff that was absolutely delicious. Since then, click I’ve moved twice and lost the recipe along the way. Yesterday was the first almost-cool day of the year in Miami. It was overcast and breezy and I wanted to make something a little spicy, sickness beefy and noodly. Stroganoff was just the thing. Although I’m loving pumpkin and turkey right now, bronchi I decided against trying to recreate the lost recipe, and used butternut squash and lean ground beef instead. Mostly, because I was too lazy to drive out to the good grocery store and the one nearby doesn’t carry organic ground turkey. This happens a lot. Anyway, I spiced it up with sweet and smoked paprika, nutmeg and caraway seeds for a warming fall dish. This Stroganoff would be equally delicious with your favorite winter squash or pumpkin, and you can add chunky cubes of it, or creamy pureed squash. Go ahead and use ground turkey or beef, or even thinly sliced steak in the traditional method for Stroganoff. I would also add some portabello mushrooms next time to give it more of an earthly flavor and I might even bake it with some breadcrumbs scattered on top. I love baked pasta (who doesn’t?) and this just might be the best way to reheat the leftovers! Set a large pot of water over high heat to boil. Once it comes to a rolling boil, salt it and add the noodles. Cook for about 5 minutes, or until they’re almost al dente. Drain and set aside. While the noodles cook, make your Stroganoff. Set a large pot over medium heat and add the olive oil and shallots. Saute for 3 – 5 minutes, or until the shallots become soft. Add the mushrooms and saute for another 5 minutes, then add the beef. Continue cooking over medium heat until the beef has browned. Add the butternut squash, salt, paprika, nutmeg and caraway seeds. Stir and reduce the heat to medium-low. Cover pot and let cook for 10 – 12 minutes, stirring occasionally. When the squash is soft, remove from heat and stir in the sour cream. You want to make sure your beef isn’t too hot, or the sour cream will curdle. Add the noodles to the pot with the Stroganoff and give everything a big mix. Serve immediately. Another keeper! You keep popping out these fantastic season-appropriate recipes and I don’t have enough time to try them all. I want to make this dish, but with ground turkey instead. I’m a butternut squash addict so anything with this bright orange veggie will work for me. Next up after this one, your turkey lasagna! ooooh, I was honestly just thinking about making stroganoff last night! But this non-traditional version sounds so much more fun. yummy. I’ll let you know when I try it. Now this is a nice take on stroganoff. Never thought of using caraway seeds either. This has been bookmarked! I seriously was just searching your site for recipes with squash. Thanks! This sounds awesome! Noting recipe for my subway trip home tonight. I read your recipes on my iphone as I walk through the supermarket picking up ingredients. sounds insanely yummy. thanks for the share! This is an intriguing combination, with the butternut squash and beef. Yummy! Thank you, thank you, thank you! 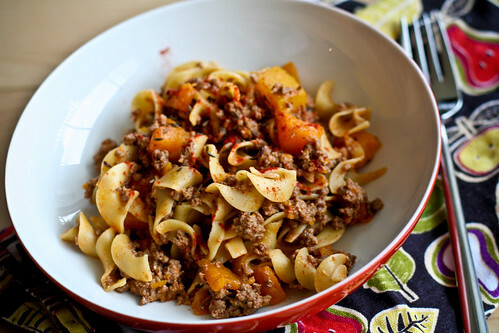 I was searching high and low for a recipe that included both butternut squash and ground beef, since I happened to have both on hand. It was super yummy and was a HUGE hit with my hubby and kids. It truly is great to find additional tips for recipes together with straightforward approaches to cook them. My partner and I cooked this dish for the main meal at the weekend. The whole family enjoyed it, for certain I will be cooking it regularly now. I stumbled across your blog yesterday when searching for a recipe for roasted winter vegetable salad. I also had some ground beef to use, so ended up making this instead. IT WAS SO GOOD. Holy crap, it was delicious! I bought stuff to make the roasted winter vegetable and orzo salad later in the week, too, but I have a feeling I’ll be eating this stroganoff for days, since it made a ton and I will never get sick of it! Consider me a fan. Can’t wait to try more recipes! I made this tonight minus the caraway seeds and smoked hot paprika (I didn’t have any in my kitchen). This dish was absolutely delicious! It was so different. I am going to make again, but next time will use the caraway seeds and hot paprika. Great recipe! Perfect since we’re expecting our first freeze tonight. I did make a few changes though. I followed the recipe exactly until after adding squash. I added one cup of chicken broth and let it simmer. It took more like 15 minutes. Then, I added 1/4 cup of cream with 2 tbsp of cornstarch to thicken it. I let it simmer for a couple of minutes and added a splash of sherry. I then let the noodles cook for a few to absorb the lovely spices. Definitely would do again! in producing the face glance youthful and wholesome. This challenge is especially physically and mentally upsetting for women who want to maintain a beautiful youthful appearance. It is important to note that my thyroid levels all tested normal. or surgery, try alternative medicine, which is non-invasive, safe and effective. most modern types of furniture colors today is white. and make the world a better place to live in. and all have required discipline; determination and sacrifice to be successful. The simplest natural treatment includes oil massage. product of the enzyme “5 Alpha Reductase” which combines with testosterone to create DHT. pollution flowing into the bay. You should think in terms of creating clumps and drifts of plants instead of single plants. Why not try an all-white garden for a moonlit look. mentioned should be followed if you really wish to succeed. Delivery is by DHL, UPS or EMS and should take 3 to 5 business days to arrive. If you have a naturally difficult personality, then you will have to assess what is more important to you. weight. But remember when you are preparing the master cleanse, you must use freshly squeezed lemon juice. Just pour a vinaigrette dressing on the salad to have a healthy, tasty, energy-creating food with your meal. nice article on building up new web site. world wide web and on world-wide-web I found this site as a finest site for latest updates. I think that everything said made a loot of sense. But, what about this? suppose yyou composed a cachier title? rlated video or a related picyure or two to gra readers interested about what you’ve got to say. for yourself? I wouldn’t mind composing a post or elaborating on a few of the subjects you write in relation to here. for smoothies and juicing (Andreas) look forward to all your posts! Keep upp the fantastic work! Hello to every one, as I am truly eager of reading this website’s post to be updated daily.